Muammar Muhammad Abu Minyar al-Gaddafi(Arabic: مُعَمَّر القَذَّافِي‎ Muʿammar al-Qaḏḏāfī audio (help·info))[variations] (c. 1942 - 20 October 2011) was a Libyan politician. He was the ruler of Libya from 1969 to 2011. Muammar al-Gaddafi was born in a tent near Qasr Abu Hadi. His family came from a small tribal group called Qadhadhfa. His family were Arabized Berber in heritage. He joined the Libyan military in 1961; the military was one of the only ways for lower class Libyans like him to rise in social status. He became a colonel. He ruled Libya from September 1, 1969 to August 23, 2011. Gaddafi became head of state after removing King Idris from power in a 1969 bloodless coup. After the coup, Gaddafi started the Libyan Arab Republic. He was one of the longest-serving rulers in history who was not a king or a queen, because he had ruled for more than 41 years. Gaddafi used Arab socialist and Arab nationalist ideas. He published a book about his philosophical views in 1975. This book is commonly known as The Green Book. In 1977, he left the power of Libya, and continued playing role of revolutionary, people called him the "Brother Leader and Guide of the Revolution". In the 1980s, he developed chemical weapons, because of it critics called Libya a pariah state. A Dutch investigation found that Gaddafi had built up a "billion-dollar empire", from assets in an international company in the oil industry. It also claims that his assets are scattered throughout much of Europe, Despite no trace or proof for even 1 billion have been found. 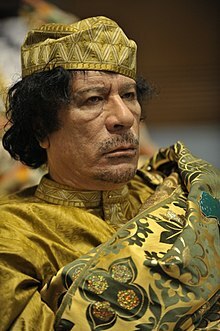 Gaddafi had a strong interest in geo-political control, was a firm supporter of OAPEC and led a Pan-African campaign for a United States of Africa. In 1986 Libya was bombed by US, home of Gaddafi was targeted but he survived. Bombing was condemned by many nations and also by UN. In 1988, the United Nations imposed economic sanctions on Libya. Gaddafi started to have closer economic and security relations with the West. He cooperated with investigations into alleged Libyan anti-western acts, by 1999 he offered to dismantle weapon of mass destruction of Libya, which would be inspected in 2003. As a result, the UN sanctions were lifted in the same year. In February 2011 there were major violent protests against Libyan government. These came alongside other demonstrations in Tunisia, Egypt, and other parts of the Arab world. The protests quickly turned into a civil war. Gaddafi vowed to "die a martyr" if necessary in his fight against rebels and external forces; he also said that "peaceful protest is one thing but armed rebellion is another." On 17 May 2011 the International Criminal Court issued a request for an arrest warrant against Gaddafi for alleged crimes against humanity, which was approved on 27 June and a warrant was issued by the court. On June 2011, according to investigation made by Amnesty International, it was found that there was no evidence for many of the alleged crimes, and that the rebels had falsely blamed Gaddafi as well as the government. Gaddafi was captured alive and killed in Sirte, Libya, on 20 October 2011. ↑ "Nato strike 'kills Saif al-Arab Gaddafi', Libya says". BBC News. 1 May 2011. ↑ 2.0 2.1 "Nato strike 'kills Gaddafi's youngest son'". www.aljazeera.com. ↑ "NBC's Mitchell Regurgitates Gaddafi Lies". Accuracy in Media. 22 February 2011. ↑ Barker, Anne (2011). "Gaddafi captured, killed in Sirte - ABC News (Australian Broadcasting Corporation)". abc.net.au. Retrieved 21 October 2011. ↑ Background Notes, (November 2005) "Libya – History", United States Department of State. Retrieved on 14 July 2006. ↑ "Qaddafi and the Libyan Revolution; The Making of a Pariah State: The Adventurist Policies of Muammar Qaddafi". 28 January 2009 – via www.foreignaffairs.com. ↑ Keller, Paul (6 January 2004). "Libya's two decades as pariah state". BBC News. ↑ "Gaddafi's Dutch millions, Radio Netherlands Worldwide". Rnw.nl. 24 February 2011. Retrieved 28 February 2011. ↑ Robinson, Jeffrey (26 August 2011). "Muammar Gaddafi Hid Billions of Dollars, but No One Can Find It" – via www.thedailybeast.com. ↑ "Gaddafi: Africa's 'king of kings'". BBC News. 29 August 2008. Retrieved 27 February 2011. ↑ "A/RES/41/38. Declaration of the assembly of heads of state and government of the organization of African Unity on the aerial and naval military attack against the Socialist People's Libyan Arab Jamahiriya by the present United States administration in april 1986". www.un.org. ↑ Sputnik. "Defiant Gaddafi vows to fight on, crush protests". sputniknews.com. ↑ "Protesters deserve to die, Gaddafi says". gulfnews.com. ↑ "Gaddafi defiant as state teeters – Africa". Al Jazeera English. 23 February 2011. Retrieved 23 February 2011. ↑ "Middle East and North Africa unrest". BBC News. 24 February 2011. Retrieved 24 February 2011. ↑ "Libya: ICC issues arrest warrant for Muammar Gaddafi". ↑ "Media Lens - Media Lens". www.medialens.org. ↑ "Muammar Gaddafi killed in Sirte". Al Jazeera English. 2011-10-20. Retrieved 2011-10-20.